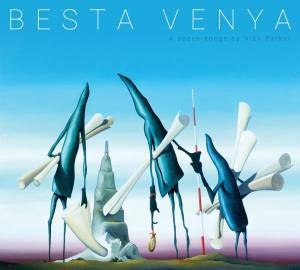 It’s always such an honour when an artist lets me have a sneak preview of a forthcoming release – I’ve been listening to Nick Parker‘s album-in-waiting, Besta Venya, for the last few weeks now. Nick was a new discovery for me last year but he’s catapulted himself firmly as one of my very favourite songwriters and performers – be it in solo acoustic mode or with his band, The False Alarms. If you don’t want too much by the way of spoilers before listening yourself, don’t read on! I was reading an article the other day that explained that depending on whether you major on left brain (logical) thinking or right brain (creative) thinking helps to dictate whether your appreciation of music centres on the lyrics (left brain) or the melody (right brain). Whenever I do tests to try to pigeon-hole my brain I generally come out balanced between left and right – so perhaps it’s not surprising that I find both pretty important in my very favourite music – I bring that up because Nick excels at both, he’s a clever lyricist and puts them to lovely tunes too. There’s a thoughtful mixture of full band big sounding tracks, delicate acoustic ditties – there’s poignancy and humour throughout. Nick manages to create music that perfectly balances on the tightrope of being charming without being twee, and his songs are frequently drenched liberally with the kind of self-effacing modesty that – if you’ve ever had the opportunity to speak to him (and you should definitely do that) – wouldn’t be in the least bit surprising to you. Some of the songs are very familiar from recent gigs, others are new discoveries – but it’s genuinely a wonderful collection of music. The album kicks off with Make Yourself At Home, a pacey and swirling energetic beginning dealing with the kind of isolation a performer might feel, littered with characteristic metaphors for essentially feeling out of place – there’s fulsome backing with complimentary fiddle and guitar solos, coupled with some lovely harmonising in the backing vocal sections from Flo Parker Bombosch. It actually recounts an actual gig experience which is described in the sleeve notes, so you can discover that for yourself and have a bit of a cringe on Nick’s behalf. Down With The Yoof has been on Nick’s live playlist I suspect for the best part of a year – because it’s one of the songs that really hooked me when first seeing him perform – so it’s good to finally have a recorded version of it! Ostensibly written by his son it deals with the embarrassment a mid-life crisis ridden Dad could pose to a teenager – centered on a charity shopping trip, but recounting a litany of crimes against street-cred he’s committed in the past. It’s such a funny song. It’s one I had the honour of playing along with on my cajón recently at Paige’s birthday do too which you can watch a video of that John recorded (thanks, John!) should you so wish! It finishes up on the album with an amazing fiddle-driven instrumental that you can have a right good jig to (it’s reel, I have since discovered – performed wonderfully by Clare Tarling). These two energetic full band tracks are followed up with a much slower paced number, Guess I’ll Never Know features ponderous guitar strums with gentle keyboard overlays along with a bit of subtle electric guitar work. Nick’s vocals kick in initially, recounting a tale of regret in ‘clicking’ visually at least with somebody on a train journey but not acting on it, followed up with the tale from the other side, with some beautiful singing from Saoirse Casey – ending up in harmonising for the chorus, it’s really quite enchanting, with strings coming in to fill out the backing track wonderfully as the vocals are kicked up a notch to really pull at the heartstrings. Just lovely. Then the pace is picked straight back up and it’s another one that will be familiar to folk who’ve seen Nick performing recently. Live it is often accompanied by placards to help the crowd learn a bit of German whilst singing along – before getting the recording I’d always just referred to it as The German Song but it’s actually called Es Tut Mir Leid. Nick performs regularly in Germany and this recounts the numerous occasions when he’s been accused of being too apologetic and polite – I’m not sure I’d be so generous as to ascribe this purely to being an English trait, I know plenty of impolite English people! It also has a flugelhorn in it, which is frankly the best name for an instrument ever, along with trumpet and cornet to give it some real oomph (or oom-pah?). The brass section really adds to the immersive quality of the track – juxtaposing nicely against the apologetic nature of the lyrics with a truly celebratory sound. Having already recruited his offspring to stick the boot in on his fashion sense, next up Kenny his dog gets an opportunity to offer a scathing appraisal of his song writing process in An Open Letter To My Human. A gentle-paced guitar-driven song in which Nick’s credentials for writing a politically themed song is brought into question. I think I first heard him play this with the band at Farmer Phil’s last year, and some of the lyrics really jumped out – amongst my favourites are ‘You think an opinion poll is a cocky European’ – but it’s some of the clever rhyming cheats in there that really tickle my lyrical funny bone, I’ll leave it to you to discover them for yourself. Half a Song for Suzy starts with some radio tuning and static, which remains throughout with some affirming words harmonised over it with guitar strums eventually battling their way over the static – a gentle and encouraging interlude of sorts. I’m not sure whether there’s some reversed vocals at the end – it kind of reminds me (not in a ‘it sounds like it’ kind of way) of Don’t Stop from The Stone Roses’ self-titled album – not really sure why but it always springs to mind as its playing so there must be something in it! I’ve subsequently discovered it was recorded entirely on a phone using the mic on the headphones and Garageband in a supermarket car park! Initially Ode to Marburg almost sounds like a lament with a gentle start of guitar and vocals – but it soon floods with warmth and palpable joy of recounting the feeling of anticipation of visiting a much loved destination to perform. I googled Marburg after listening and it does look like a magical place, to be fair. 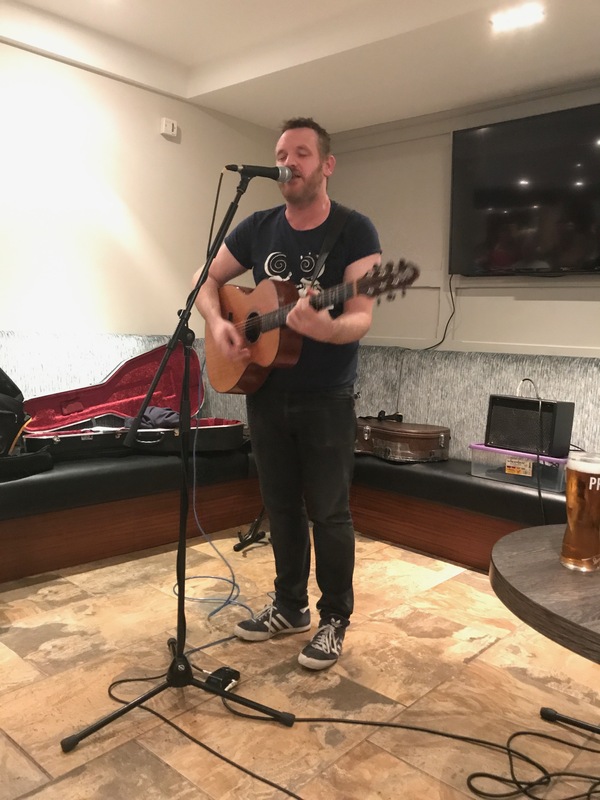 The song is sentimental yet pacey for the full band sections – finishing out gently again and leaving the listener with an irrepressible urge to want to nip to Marburg next time Nick is playing a gig out there (or when he isn’t to be fair!). A Simple Song is well, a simple song I suppose! Mandolin driven (with both strumming and some nice picked bits in the instrumental section too) and it’s a duetted piece with Nick’s daughter Flo Parker Bombosch – a tale of wanting to be able to provide life’s luxuries but not being able to, aside from offering the simple song itself. 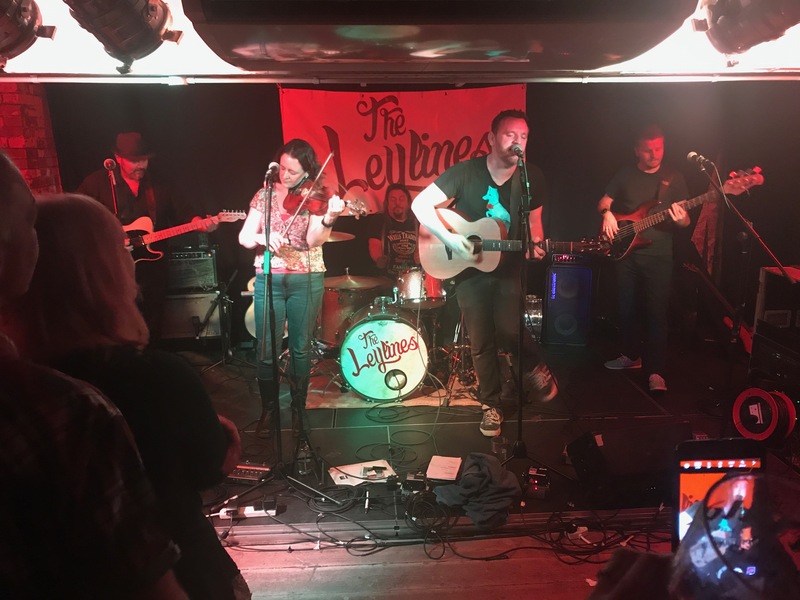 Departures is another we’ve heard a few times at gigs – for anyone who likes people watching in public places then you’ll love this song, easy to bring to mind caricatures of characters encountered at an airport is deftly and humourously dealt with. Starting out with guitar and vocals the intensity builds – as the lyrics spin round to him making pretty unkind observations about what turns out to be his own reflection, the band kicks in behind for an extended outro along with what should surely become an irresistible singalong section with lots of ‘la la la’ (or ‘ba da da da’ bits if you feel racy!). It’s a cleverly crafted song, and as the instrumental slowly fades out finishes with what I can only presume is a sigh of relief – I do like it when recordings retain moments like that, I hope it stays for the released one! If you refer to the sleeve notes you’ll discover the announcer lady at Bristol Airport is a bit grumpy. More Like This is a gentle chide to what must be bane of a songwriters life – people suggesting things they should write songs about (amusingly I know I’ve definitely done this to Nick before, but I still think that the mushroom story could make a cracking song – ha!). After an atmospheric keyboard intro the vocals and guitar kick in (possibly with mandolin too) and empassioned vocals – recounting a list of presumably real suggestions for songs he’s been in receipt of, skillfully telling the stories but making them sound pretty mundane – perhaps underlining the point that they weren’t really great things to be writing a song about! Collectively, however, they do make for a fun and witty song – so there’s a paradox in there somewhere! The pace is slowed up again for Not Fooling Me – gentle melodic guitar picking is accompanied by vocals – eventually with more instrumental tracks gently joining in to give it some real depth. It’s a really quite emotional listen – the pace remains slow ’til the end before The Other Half brings the album to a triumphant finish with an epic instrumental that reminds me of some kind of fusion of Elbow’s One Day Like This and something by The Polyphonic Spree – it’s the second part of Half a Song for Suzy and has a much more optimistic and celebratory feel to it along with the reassurance of the first half – a perfect way to end the album (plus it gives me another excuse to type flugelhorn! FLUGELHORN!!). So that’s Besta Venya – I’ll let you try to work out what the title means for yourself (to be fair, I needed to be told, Ella worked it out before I was even vaguely on the right track when we were driving back from Droitwich with Nick! 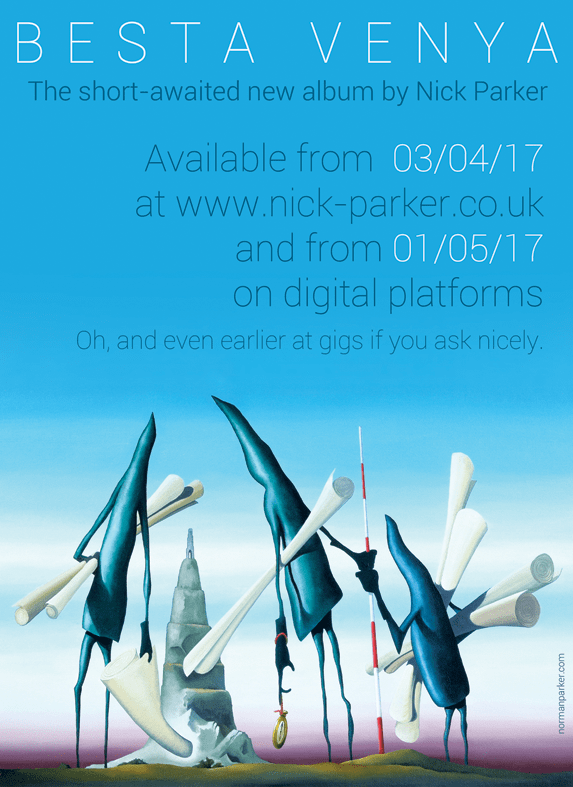 ), but it’s definitely an album you’ll want to be getting hold of – it’s available for pre-order now for an early April release, although if you’re going to see Nick perform between now and then (which you should most certainly aim to do!) he reckons he’ll have some to sell at gigs from mid-March. Failing all that it will be available at your preferred digital outlet from May. If you don’t believe me, then you could check out this review by Dave Franklin – which is (of course) a lot more succinct than my waffle-fest! The album artwork is worth flagging too, created by Nick’s dad – Norman Parker – a surreal artist (surrealism being his genre, I’ve no idea whether he’s actually surreal or not! ), it’s really eye-catching and curiosity-piquing, and with familial contributions in the form of backing vocals and songwriting too a real family effort! As I just went through a final read through to tease out the assorted typos and mistakes that littered my severalth draft of this review I realised this is my two hundredth blog post on here. Wow! It feels a fitting entry for a landmark post!